President-elect Luise Guillermo Solís on Monday, as expected, announced the balance of cabinet appointments. 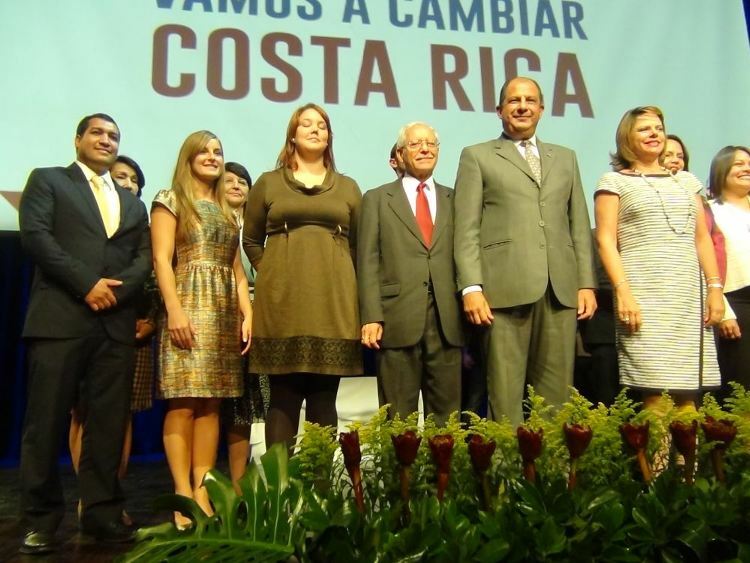 With “vamos a cambiar Costa Rica” (we will change Costa Rica ) banner behind him, Solís named to key government posts two former ministers of the Partio Unidad Social Cristiana (PUSC). 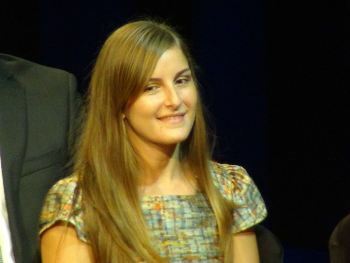 Solís entrusted the Ministerio de Relaciones Exteriores (Foreign Ministry) to Manuel González Sanz and the Caja Costarricense de Seguro Social (Social Security) to María del Rocío Sáenz Madrigal. President-elect Luis Guillermo Solís stands in front of his most recent appointees to key administration posts. The first appointments were made on April 14. Still left are three posts to fill. Both were ministers in the administration of Abel Pacheco de la Espriella ( 2002-2006). González was Minister of Foreign Trade between 2004 to 2006 and responsible for the presentation of Free Trade Agreement with the United States to the Legislative Assembly. He was also ambassador to the specialized agencies of the United Nations (UN) in Geneva, Switzerland, between 2002 and 2004. Saenz, is a medical doctor and was Minister of Health during the four years of the Pacheco administration. With the appointments of González and Saenz, four of Solís’ future ministers were cabinet ministers of a PUSC government. The other two are, Helio Fallas and Víctor Morales, the future Finance Minister and Minister of Labour, respectively, whose appointments were announced on April 14. An Cristina Trejos will be the deputy minister of Housing. Fallas headed Planning and Housing in the administration of Rafael Angel Calderon Fournier (1990-1994) and Morales was the minister of Labour in the administration of Miguel Angel Ángel Rodríguez (1998-2002). Solís was very clear that the PUSC appointments do no represent any behind the scene deals with the PUSC party or party leader Rodolfo Piza. “If so, I would say it”, said Solís. Melvin Jimenez, Ministro de la Presidencia, said that the ideas of Piza were consistent with theirs: “When we compared programs, we said, if there are no disagreements, why not bring in this very qualified woman who wants to take on the fight?”. Solís appointments also bring a younger face to his government, naming two young women to head important posts: 26 year old Ana Cristina Trejos, a microbology and social work student at the Universidad Costa Rica (UCR); and 25 year old Ana Gabriela Zúñiga, the youngest member of the Solís cabinet. Trejos will be the new deputy minister of Housing, whose main experience is with the “Techo“, a nonprofit organization that mobilizes youth volunteers to fight extreme poverty in Latin America. The NGO worked closely to build housing for the affected of the Cinchona earthquake. Zuñiga will the right hand of Melvin Jiménez at Casa Presidencial, as deputy minister of the Presidency, her role is to keep close ties with the Legislative Aseembly and reach out to communities to visbly promote youth policy. While women make up a large part of the cabinet, Solís did not fufill his promise of an equal number of women and men in his appointments, admitting to the “small gap”. So far, with three appointmments still remaining, only six of the thirteen ministerial appointments are women. 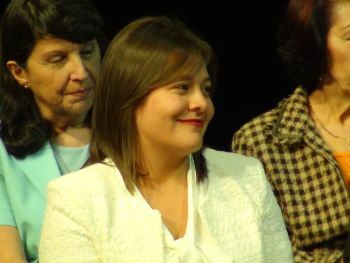 With respect to state agencies, six of the eleven appointments are women: Sara Salazar Badilla, who will be president of the state refinery, the Refinadora Costarricense de Petróleo (Recope); Yanina Soto, to head up the Instituto de Fomento y Asesoría Municipal (IFAM)- advisor agency to the municipalities; Ana Teresa León, the Patronato Nacional de la Infancia (PANI) – child welfare service; and Delia Villalobos, to run the Junta de Protección Social (JPS) – the state lottery.